Drain and run under cold water to stop it from cooking. Set aside to cool further. In a large bowl, whisk together olive oil, tarragon vinegar, chopped tarragon, salt and pepper. Stir in the vegetables and the cooked tortellini. When everything is well combined, taste, and add salt and pepper, if needed. Sprinkle parsley over pasta and vegetables, and stir gently until combined. Refrigerate for as little as an hour or as long as overnight, or serve immediately. Growing up in New York’s Hudson Valley, I developed a profound affinity for green things—leaves, grass, plants, Frankenstein. Just kidding about the last one. I had an affinity for him way before I moved to the Hudson Valley. I slogged through the dull brown and gray winter knowing that as soon as Easter rolled around, the green would soon follow and all would be right with the world again. When I decided to move to Manhattan, I didn’t realize that green was a barely existent hue. While I loved living in Manhattan and couldn’t imagine living anywhere else, I missed the green beyond measure. When I finally moved to the Upper West Side near Riverside Park, I knew I had found my green holy grail. At the end of 93rd Street, where I lived, the tall, beautiful trees that surrounded the Joan of Arc statue cloaked my view of the Hudson River for half the year. In April their bare limbs would slowly develop pale green fuzz that, by Memorial Day, would give way to the most vibrant verdure I’ve ever seen. The accompanying blossoms were the icing on the cake. As my then-four-year-old son Max and I walked through Riverside Park when the cherry and crab apple trees were blooming, I would pretend we were in Paris. I imagined us at home after our walk, eating a beautifully ripe Camembert and taking turns quoting our favorite Molière lines. Back on earth, when I spoke to my sweet boy in French, he would just shake his little blond head and bolt for the nearest tree to climb. When my fire-escape basil, parsley and thyme sprouted I couldn’t have been happier. I took pictures with an old Kodak Instamatic and showed them to my coworkers and neighbors with almost the same pride as when I showed photos of Max. I was so fulfilled by having accomplished the actual growing that it never occurred to me to cook with the herbs. I let them grow and wither, chronicling their journey with my Kodak and in my journal. Now I live in a place where it’s green only for two weeks in February, and I can’t grow a flippin’ thing, except rosemary, which I use all the time. We have a patch of mint and oregano growing in the backyard, and I use to cook with them all the time―until two dogs joined our family. Those patches of landscape are now ruled by the dogs, and my witty son has renamed the mint shint because of the most popular activity the dogs engage in there. I love cooking with fresh herbs, so I often resort to buying already-thriving pots of basil, thyme and mint that I keep on my sunny kitchen windowsill and use in just about everything except cereal and coffee. I may be living with environmental challenges, but I’m dreaming of the day when I can once again stick my head out my living room window, look west and see those beautiful harbingers of life gently swaying in the spring breeze. Though there is a decent amount of vegetable prep here, it’s not pressurized vegetable prep. You can get it done at your leisure, while cooking the tortellini and texting one of your girlfriends about how your hair is driving you to the brink of insanity. If you use a food processor to grate the zucchini and carrots, you’re doing yourself a big favor. The vegetable amounts are the proportions that I find tasty, but, as always, feel free to adjust according to what you like. If you want pasta without cheese, penne or fusilli are excellent substitutions. The good thing about this salad, besides its ease, wonderful colors and spectacular taste, is that it can be eaten cold or at room temperature. I like this best the next day, after the herbs have had a chance to cohabit with the tortellini and vegetables. 1. Cook tortellini per package instructions. (Fresh tortellini takes 6-8 minutes to cook. I like it al dente, so I tend to cook it for the least amount of time.) Drain and run under cold water to stop it from cooking. Set aside to cool further. 2. In a large bowl, whisk together olive oil, tarragon vinegar, chopped tarragon, salt and pepper. 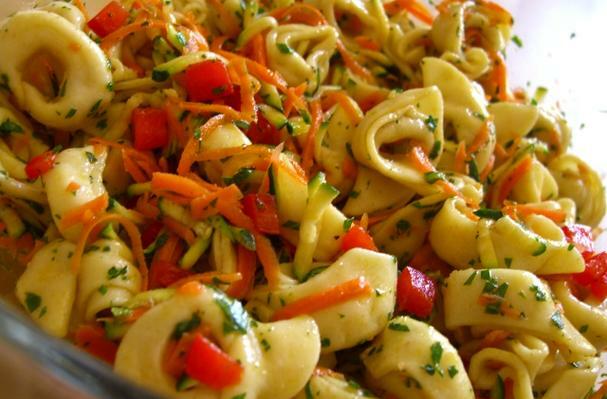 Stir in the vegetables and the cooked tortellini. When everything is well combined, taste, and add salt and pepper, if needed. Sprinkle parsley over pasta and vegetables, and stir gently until combined. Refrigerate for as little as an hour or as long as overnight, or serve immediately.